The outstanding innovation of the 4th Meeting is to have opened up the dialogue between the “ambassadors” of people experiencing poverty and “invited guests”, the key contacts at official and decision-making levels. “The most important thing is taking part”. This – hackneyed or consolatory – quotation from Pierre de Coubertin has been given new legitimacy, as accurately reflecting a constant refrain of the delegates: the important thing is taking part in the European Meetings, being there to say what poverty is, being there to say that poverty is not a horrid inevitability, there is no guilt attached to it, and that people experiencing poverty can not just exercise their voice, but also analyse and take action. Their testimony at this Meeting made it possible to address the image of poverty – that selfformed by those enduring it, and that formed by others. Unanimity: The unanimous view was that the image of poverty is often stereotyped and even grossly distorted, and that the media tend to approach it from a sensation-seeking and seasonal angle. There was near-unanimity that the current NAPs were quite inaccessible, and that people experiencing poverty must be involved in them from development, through to evaluation. A dialogue has been started up in some Member States, and only needs to develop further. 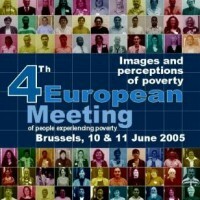 There was general agreement that good practises are to be found; that different kinds of key contacts and journalists can be allies in tackling poverty; that there are always some with ethical standards who can understand what poverty is; and that many key contacts and actors could benefit from training by “experiential experts”, as is starting to be done in Belgium. Subjects not closed: Outstanding issues from previous Meetings – jobs, discrimination and racism, liberalization of services and support for anti-poverty mechanisms and networks – were clarified and updated, but still have not been fully explored. Access to employment remains an acute problem; but it is no longer just the jobless who are poor, but also those in work: 14 million working poor in Europe. It is a bewildering figure that casts serious doubt on the outpouring of slogans like “jobs and growth are a way to tackle poverty”. More growth and more jobs do not spell less poverty. Should this finding be borne out, the Commission has pledged to take action towards the governments. The trade unions are fully involved in the fight against poverty, in collaboration with all social and political actors. The absolute necessity of establishing a minimum income was placed firmly centre stage, and emphatically supported by the European Commission. Social exclusion is even worse for immigrants and minorities. The fight against poverty cannot be divorced from that against discrimination and racism which, the Commission pointed out, is a matter of rights for legally resident migrants in Europe. Liberalization of services was another concern: while the debate on the concept of services of general interest may be ongoing, and there is a European reference to universal services like electricity and water having to be affordable, the plain fact is that none of these services is liberalized. Europe can only remind governments of the need to fulfil their regulatory responsibilities for the supply of “universal goods”. And what of social and health services? There was universal agreement that social and health services should not fall within the European directive on services in the internal market. Building more effective networks to combat against poverty, especially through better funding, is still called for. Participation by people experiencing poverty? The French and Dutch rejections of the constitutional Treaty are less a snub to Europe than its failure to communicate and inform, and a reminder of the importance of the local, “face to face”, level in a steadily-expanding Europe. This level of decisionmaking and participation is cardinally important in the fight against poverty. A voluntary community (circulatory) system spreading from the local to European level exists or is developing in the fight against poverty: networks enabling a two-way up-down flow are developing; they are as yet under-developed, but only need strengthening to consolidate a dialogue that is under way. Promoting participation also involves setting up structures and mechanisms to encourage the circulation of lifeblood throughout the (social) body. Dialogue must be established with Europe, but also with key contacts and local politicians, who also project the image of poverty, and can portray it negatively through the figures, or positively by implementing concerted policies. The local level, voluntary networks, ongoing dialogue between people experiencing poverty, their organisations and policy makers, factoring in expertise and experiences as the foundations of a new solidarity-based social Europe in which the fight against poverty is mainstreamed across all areas where there is exclusion: this is what was said and happened at the 4th Meeting. And all participants learnt something from one another, all have something to give, all can and want to contribute to building a more just society. training social service practitioners and educators in how to co-operate. building awareness in front line administration. faltering mainstreaming, i.e., too little integration of actors who also influence the creation of poverty, like the criminal justice system, education (from basic to specialised), care provision, transport, urban planning and development… to cite only the most obvious. dispelling the fear of sliding into poverty: manipulated by some superficial, sensation-seeking, profit-driven and not always free media,“Mr and Mrs Average” want to continue thinking themselves safe from poverty. But it is a delusion that does not stand up to the shock of the reality of poverty, which shows how fine a line there is between social inclusion and exclusion, leaving “Mr and Mrs Average” in no doubt that they could be tomorrow’s excluded. The outstanding innovation of the 4th Meeting is to have opened up the dialogue between the “ambassadors” of people experiencing poverty and “invited guests”, the key contacts at official and decision-making levels. They are insistent that the dialogue must go on, that “better understanding comes from talking face to face” and that the European Lisbon Strategy must be taken forward.